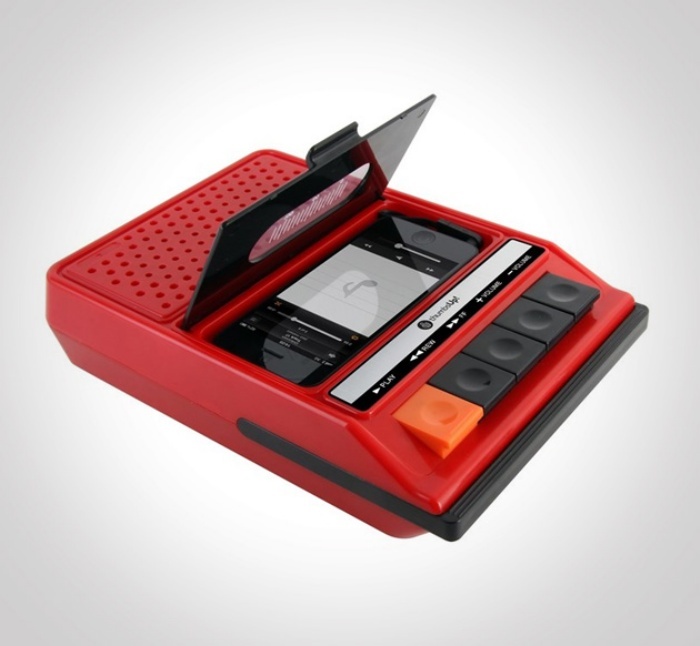 iRecorder iPhone Speaker: Play New Beats With a Vintage Vibe | OhGizmo! By Hazel Chua on 01/31/14 • Leave a comment! Remember those vintage recorders that you used to carry around way back when they were the hottest gadgets around? Digital music players and smartphones have rendered them obsolete, but they’re about to make a comeback in a roundabout sort of way. The iRecorder Speaker is a handy speaker that’s compatible with the iPhone 4, 4S, and 5. It sports that vintage recorder look on the outside, but it won’t be able to play your old cassette tapes. However, it will be able to play the tunes on your phone. Just pop your mobile into the cassette slot and push down the orange play button. The iRecorder comes with a pull-out carry handle and a USB charging cord. It can be powered by a micro USB or batteries, just like your old recorder. It’s available online for $50.